This is so cute, I love how you have done the bird and stacked hearts. Bright and pretty. So pretty, the colours are fabulous! I like the look of paper piecing, too, and this is a great example of it. Such a cute card! Sp pretty. Thanks for joining us this week at Eureka Stamps for our Recycling Challenge. This is too cute! Love the paper-piecing and the CAS design. So blessed you joined our bi-weekly Challenge at Word Art Wednesday and hope you join us again for a new Challenge that started yesterday. Leaving you with the inspiration of God's Word in Isaiah 40:8 which tells us, "The grass withers and the flowers fall, but the word of our God endures forever." Awesome paper piecing! I love the colors you used and the brightens of your layout. Thank you so much for sharing it with us at Lil Patch of Crafty Friends Challenge #27. Super cute. I love these colors, it just screams SPRING! Beautifully done. Thanks so much for playing along with us at Sami Stamps. 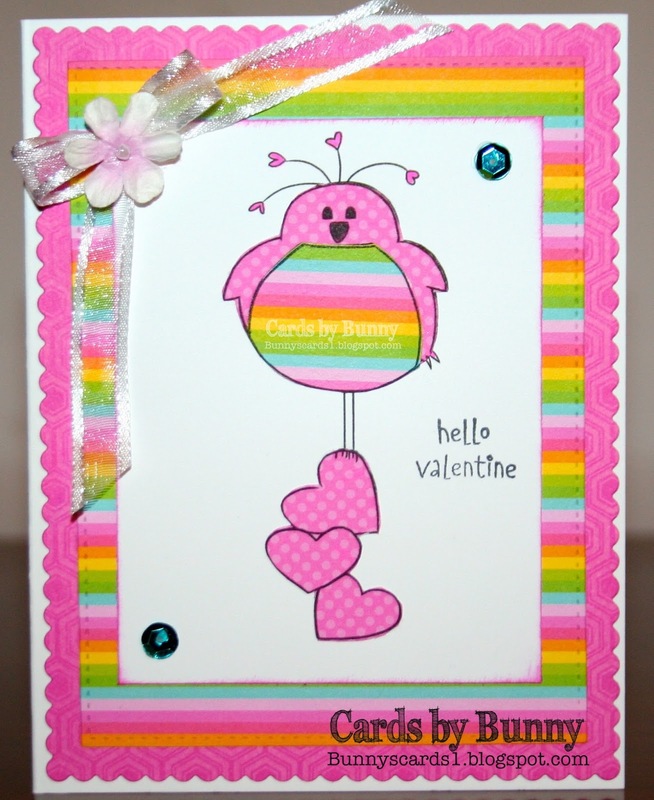 I adore this sweet card! I love the rainbow paper on the little birds belly! Adorable!! !